Labbs Convention (Ladies Association of British Barbershop Singers) is something that all Labbs associations look forward to. It normally runs in late October every year so companies have all year to perfect their performances. Whether your chorus is competing as a whole or quartet or whether you just want to come along to watch – it is so much fun. It’s a competition to showcase the best in aCapella choruses. It has a scoreboard system that takes into account music ability, presentation and singing. In 2014 we decided to enter with the package songs “Second Hand Rose” & “Time after Time”. I had joined, like many others, in the January of that year in the “Learn to Sing ” event at Blackpool Soundwaves. We started learning the songs in early April. Our MD at that time was Mrs Samantha Roberts. She was very encouraging to put together a performance that would have that extra entertainment value. As well as showcase us at our best. I was asked to do some acting within the performance. To do a copy cat of Mrs Sally Maclean who is the MD for White rosettes, who are based in Leeds. I was asked to wear Sally’s coat, she wore it as part of The White Rosettes package piece in 2013 with their Cruella DeVill song. It looked just like the Disney 101 Dalmatians coat Cruella wore. It was both enthralling and scary. 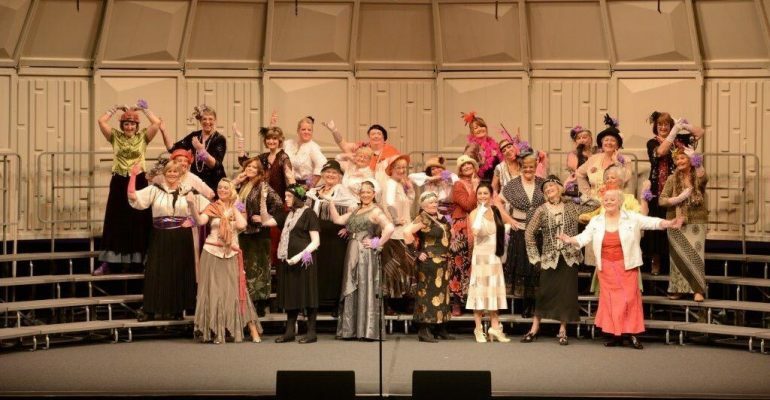 When we added into our song about “Sally’s old fur coat” that was when I had to push past everybody, walk down the risers, come out of the stack and walk to the front of the stage – giving the judges a evil grin and point as everyone else carried on singing. The whole chorus laughed every time it came to this bit in rehearsals. But before the day everyone was told strictly not to laugh but to act scared and shocked. The whole audience laughed when I did that , even the judges panel. Everyone found this event a great challenge, but we all enjoyed every second of the time we had in the spotlight. As for me personally it gave me the encouragement and confidence I needed to enjoy what I do more. This was mine and at least ten other ladies very first convention. We all felt privileged to be a part of it. It was such a buzz for everyone that took part. I will never forget that day for as long as I live! Unfortunately we are not taking part in this years #Labbs16 but I look forward to when we do!